Human CMV has evolved multiple strategies to interfere with immune recognition of the host. A variety of mechanisms target Ag presentation by MHC class I molecules resulting in a reduced class I cell-surface expression. This down-regulation of class I molecules is expected to trigger NK cytotoxicity, which would have to be counteracted by the virus to establish long-term infection. Here we describe that the human CMV open reading frame UL40 encodes a canonical ligand for HLA-E, identical with the HLA-Cw03 signal sequence-derived peptide. Expression of UL40 in HLA-E-positive target cells conferred resistance to NK cell lysis via the CD94/NKG2A receptor. Generation of the UL40-derived HLA-E ligand was also observed in TAP-deficient cells. The presence of a functional TAP-independent HLA-E ligand in the UL40 signal sequence implicates this viral gene as an important negative regulator of NK activity. Viruses have evolved multiple strategies to escape CTL responses by interfering at different steps with the MHC class Ia Ag presentation pathway. For the human CMV (HCMV)3 the gene products gpUS2 and gpUS11 redirect nascent HLA class I H chains into the cytosol for degradation (1, 2). Whereas gpUS3 retains HLA class I complexes in the endoplasmic reticulum (ER), the gpUS6 inhibits the delivery of antigenic peptides into the ER by TAP (3, 4, 5). All of these mechanisms result in a decreased HLA class I cell-surface expression, which can be sensed by killer inhibitory receptors (KIR) on NK cells. In consequence, HCMV-infected cells may become more susceptible to NK-mediated lysis. However, HCMV apparently also evolved strategies to counteract NK susceptibility. The US2 and US11 gene products do not affect HLA-C molecules, thus allowing inhibition of a subpopulation of NK cells bearing KIR2DL1, KIR2DL2, and KIR2DL3 (6, 7). Therefore, HCMV may have developed additional strategies to control NK cell lysis. The class I homologue gpUL18 may act as a surrogate ligand to prevent NK-mediated cytotoxicity and was shown to interact with ILT2 (8). However, no increased susceptibility of fibroblasts infected with a UL18 knockout mutant of HCMV could be observed (9). In addition, ILT2 is only expressed on a subset of NK cells (8). Another potential target for HCMV to control NK cell-mediated lysis is the inhibitory receptor CD94/NKG2A that shows a broad distribution on NK cells in peripheral blood (7). The only ligand known so far for the CD94/NKG2A heterodimer is HLA-E, which is expressed on virtually all cells (10). Recognition of HLA-E by CD94/NKG2A requires the binding of a TAP-dependent ligand representing the amino acids 3–11 of leader sequences of HLA class I H chains to HLA-E (11, 12, 13, 14). Here we demonstrate that an HLA-E ligand contained in the HCMV gpUL40 is processed and loaded onto HLA-E in the absence of a functional TAP complex, thereby allowing an HLA-E-mediated inhibition of CD94/NKG2A-positive NK cells. Anti-CD94 (HP-3B1) and anti-CD56 (C218) were obtained from Immunotech (Marseille, France). The mAb W6/32 specific for HLA class I β2-microglobulin (β2m) complexes was used as ascites. Anti-FLAG M2 affinity gel was provided by W. Weissenhorn (Grenoble, France). An HLA-E*01033 cDNA was amplified by RT-PCR using the primers HLA-E5′UT and HLA-E3′UT as previously described (15) and cloned into the vector pcDNA3 (Invitrogen, San Diego, CA) for transfection giving pcDNA-E. The open reading frame of 662 bp of UL40 tagged with a FLAG epitope was amplified from DNA of HCMV strain AD169 using the primers: UL40F (5′-AAGCTTGCCACCATGAACAAATTCAGCAAC-3′) and UL40FLAG-R (5′-GCGGATCCCTACTTATCGTCGTCATCCTTGTAATCAGCCTTTTTCAAG-3′; the bold sequence encodes the FLAG epitope DYKDDDDK). The correct PCR product was inserted as a HindIII/BamHI fragment into the pcDNA3.1/Hygro+ vector (Invitrogen) and termed pcDNA-UL40FLAG or as a NheI/BamHI fragment into the pcDNA 3.1/Neo− giving pcDNAneo-UL40FLAG. Culturing of the HLA class I-negative chronic myelogenous leukemia cell line K-562, of the NK cell line NKL kindly provided by M. Lopez-Botet (Madrid, Spain) and the mouse CTL clone TER-1 specific for HLA-E, has been described (15, 16, 17). Transfectants were generated by electroporation and selected by adding 0.4 mg/ml G418 and/or 0.4 mg/ml hygromycin B. The HLA-E/human β2m transfectant (RMA-S-EM) in the murine cell line RMA-S that is deficient for TAP2 has been described elsewhere (11). A representative HLA-E-positive K-562 clone (K-562-E) was stably supertransfected with pcDNA-UL40FLAG to produce K-562-E-UL40 transfectants. RMA-S-EM-UL40FLAG transfectants were generated by transfection of RMA-S-EM cells with the construct pcDNAneo-UL40FLAG and termed RMA-S-EM-UL40. Propagation of the HCMV strain AD169 has been described (18). Subconfluent monolayers of primary human foreskin fibroblasts were infected with HCMV AD169 at a multiplicity of infection of 5. Total cellular RNA of the K-562 cells was isolated as described (15). Cellular RNA of HCMV infected fibroblasts was isolated using the High Pure RNA Isolation Kit of Roche Diagnostics (Indianapolis, IN). Northern blot analysis was performed on 5 μg of total RNA as described (15). A full-length UL40 probe was labeled with digoxigenin dUTP by use of the PCR DIG Probe Synthesis Kit (Roche Diagnostics). In vitro transcription/translation was performed on pcDNA-UL40FLAG DNA using the T7 polymerase-based TNT Coupled Reticulocyte Lysate System (Promega, Madison, WI) according to the manufacturer’s recommendations in the presence of 14.3 μCi of Pro-mix (Amersham Pharmacia Biotech, Freiburg, Germany). A total of 3.5 × 106 cells in 1 ml Met− of DMEM were labeled for 30 min at 37°C by adding 143 μCi of Pro-mix. Washed cells were lysed for 30 min at 4°C in 300 μl of lysis buffer (150 mM NaCl, 50 mM Tris-HCl, pH 8.0, 1% Nonidet P-40, 1 mM PMSF, 14 μg/ml aprotinin, and 5 mM iodoacetamide). The lysates of metabolically labeled cells or 8 μl of the in vitro transcription/translation reaction adjusted to 300 μl by adding lysis buffer were precleared overnight at 4°C by adding 3 μl of rabbit preimmune serum and 10 μl of protein A-CL-4B Sepharose (Amersham Pharmacia Biotech). Supernatants supplemented with BSA to 0.1% were precipitated for 1 h at 4°C with 10 μl of anti-FLAG M2 affinity gel. One half of each washed precipitate was digested with N-glycosidase F (PNGase F; Roche Diagnostics) as recommended by the manufacturer. The other half was mock digested. The reactions were analyzed by 10% SDS-PAGE (15). Chromium release assays and peptide loading of HLA-E molecules on cells were performed as described (17). Reconstitution of lysis was tested by preincubating cells with either receptor-specific Ab at 10 μg/ml or W6/32 in a 1:100 dilution of ascites before performing the assay. Experiments were repeated three times, and representative results are shown. The open reading frame UL40 from HCMV includes in its N-terminal part (aa 15–23) an HLA-E ligand (Fig. 1⇓) identical with the one present in the signal sequence (aa 3–11) of most HLA-C alleles. No information is available on potential functions of the UL40 gene product so far. The signal prediction program SignalP (http://www.cbs.dtu.dk/services/SignalP/) produced a high probability score for the first 37 aa to function as signal peptide and predicted a signal peptide cleavage site C terminal to aa 37 cysteine (Fig. 1⇓). Three potential N-linked glycosylation sites are present in the UL40 polypeptide, but no other structural feature could be predicted. The presence of the VMAPRTLIL peptide in the presumed signal sequence of UL40 suggests that HCMV contains another NK decoy gene acting via HLA-E. To test a possible involvement of UL40 in controlling NK activity through CD94/NKG2A the UL40 open reading frame was expressed in HLA class-I negative K-562 cells transfected with the cDNA of HLA-E*01033 (K-562-E). A FLAG-tag was genetically engineered to the C terminus of the protein to allow its detection. The signal sequence of the UL40 polypeptide contains an HLA-E ligand identical with HLA-Cw*0304. The first 37 aa of UL40 are predicted to encode a signal peptide. The HLA-E ligand is represented in bold letters. The signal sequence of HLA-Cw*0304 is shown below. Potential N-glycosylation sites are underlined. In infected fibroblasts, UL40 mRNA (Fig. 2⇓A, lanes 1–7, UL40inf.) becomes detectable 24 h after infection (p.i.) and reaches a maximum level 48 h p.i. which is maintained at late times of HCMV infection, 72 h p.i., in agreement with the published early-late transcription pattern of UL40 (19). Corrected for different amounts of total RNA loaded as assessed by the staining intensities of the 28S rRNAs, the amount of UL40 transcripts in the transfectants (Fig. 2⇓A, lane 9, UL40trans.) was estimated to be 5- to 10-fold the maximum expression level observed during HCMV infection (compare lanes 6 and 7 to lane 9). 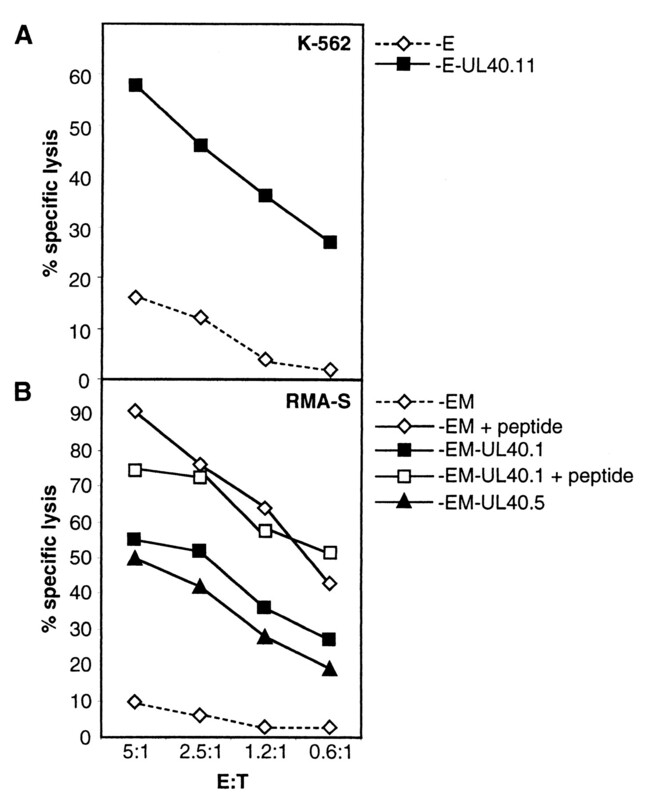 Detection of UL40 mRNA and of the UL40-encoded glycoprotein. A, UL40 mRNA expression in human fibroblasts at various time after infection (p.i.) with HCMV (see UL40inf.) as well as in K-562-E cells transfected with an expression construct of UL40 (see UL40transf.) was analyzed. Bottom panels indicate ethidium bromide staining of the 28S rRNA. B, Equal aliquots of immunoprecipitates using the FLAG-specific mAb M2 from lysates of metabolically labeled K-562-E-UL40.7 (lanes 2 and 3) and K-562-E (lanes 4 and 5) cells were treated (+) or not (-) with endoglycosidase F (PNGaseF) and analyzed by 10% PAGE. A M2 immunoprecipitate of the UL40FLAG protein generated by in vitro transcription/translation was analyzed in lane 1. The estimated molecular masses (Mr) of the detected proteins are indicated. The mAb M2 specific for the FLAG epitope precipitated a ≈31-kDa protein from metabolically labeled K-562-E-UL40.7 cells (Fig. 2⇑B, lane 2). After digestion with endoglycosidase F (PNGaseF) the Mr of the UL40FLAG protein was reduced to ≈ 21 kDa (lane 3) consistent with a mature polypeptide of 192 aa (representing a UL40FLAG polypeptide without the N-terminal 37 aa) and three potential N-linked glycosylation sites present in the protein indicating ER insertion of gpUL40. 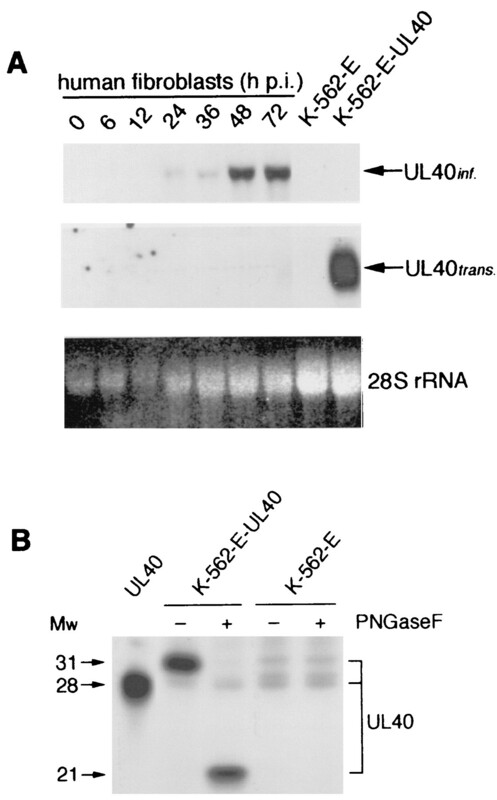 N-terminal trimming of the protein was confirmed by comparing the Mr of the UL40FLAG protein precipitated from metabolically labeled cells after PNGaseF digestion to the UL40FLAG protein precipitated from an in vitro transcription/translation reaction (Fig. 2⇑B, compare lane 1 and 3). Because the FLAG epitope constitutes the C terminus of the UL40FLAG protein, the observed difference in Mr is due to processing of the N terminus of the protein, although the in vitro transcribed/translated UL40FLAG polypeptide shows a higher Mr than expected, probably due to the hydrophobic signal sequence. All of the K-562-E-UL40 clones were protected against lysis mediated by the CD94/NKG2A+ NK cell line NKL as well as K-562-E cells loaded with the Cw03 peptide (VMAPRTLIL), whereas the untreated K-562-E cells were efficiently lysed (Fig. 3⇓A). The inhibition of the NKL-mediated lysis by the K-562-E-UL40 transfectants was mediated by CD94/NKG2A and HLA-E because incubation of the effector cells with a CD94-specific mAb and of the target cells with W6/32 restored lysis to the same extent as observed when K-562-E cells loaded with the Cw03 peptide were treated likewise (Fig. 3⇓B). UL40 expression leads to an inhibition of NKL lysis mediated by CD94/NKG2A. K-562-E cells and K-562-E cells preincubated with canonical HLA-E ligand (VMAPRTLIL) as well as K-562-E-UL40 transfectants were 51Cr labeled and subjected (A) to lysis by NKL cells at the E:T ratios indicated or (B) to lysis by NKL cells at an E:T ratio of 7.5:1 without or in presence of the mAbs indicated. To address the question of whether the HLA-E ligand responsible for the observed inhibition of lysis by CD94/NKG2A+ NK cells of gpUL40-expressing cells is the canonical ligand present in the leader sequence of UL40, we used the CTL clone TER-1 generated in mice as a very potent and highly specific cell probe recognizing HLA-E complexed with HLA class I leader sequence-derived peptides (17). K-562-E cells are recognized by TER-1, indicating that few functional HLA-E molecules are expressed at the cell surface. 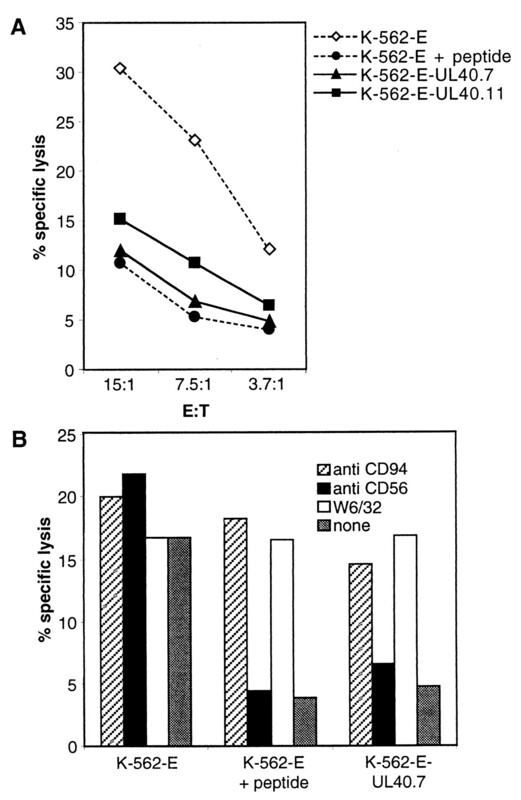 However, lysis of K-562-E cells was significantly increased when expressing gpUL40 (Fig. 4⇓A). Taken together, these data provide independent evidence that gpUL40 delivers the canonical ligand contained within its signal sequence to HLA-E although the presence of another yet unidentified HLA-E ligand in the UL40 protein cannot formally be excluded. UL40-expressing cells are lysed by the HLA-E-specific CTL clone TER-1 even in the absence of functional TAP. K-562-E cells, K-562-E-UL40.11 transfectants (A), as well as RMA-S cells expressing either HLA-E and human β2m (RMA-S-EM) or HLA-E, human β2m, and UL40FLAG (RMA-S-EM-UL40.1 and .5) preincubated or not with the canonical HLA-E ligand (VMAPRTLLL) (B) were labeled with 51Cr and subjected to lysis by TER-1 cells at the E:T ratios indicated. NK cells are an important component of innate immunity to CMV and contribute to the control of primary and recurrent infection (20). This permanent pressure on HCMV may have selected viral mechanisms that counteract the NK susceptibility of infected cells. In addition, the HCMV strategy to escape CD8+ T cells by down-regulating MHC class I may stimulate NK cells to attack. In this situation, the exploitation of a cellular pathway via HLA-E controlling a wide range of NK cells appears to be a perfect complementary mechanism. However, the HLA-E ligand provided by gpUL40 should bypass TAP1/2, which is inhibited by HCMV gpUS6. Blocking TAP function would prevent HLA-class I signal sequence-derived peptides to enter the ER. Moreover, US6 and UL40 show similar kinetics of mRNA expression (5, 19). We expressed the UL40FLAG protein in TAP2-deficient RMA-S cells cotransfected with HLA-E and human β2m and used the TER-1 CTL clone to test whether coexpression of UL40 induces the expression of functional HLA-E molecules at the cell surface. As shown in Fig. 4⇑B, RMA-S cells expressing HLA-E, human β2m, and UL40FLAG (RMA-S-EM-UL40) were susceptible to lysis by TER-1 to almost the extent achievable by preincubation with a canonical HLA-E ligand. In contrast, the parental RMA-S-EM cells were only lysed if preincubated with a canonical HLA-E ligand. Thus, gpUL40-derived peptides should substitute the TAP-dependent HLA-E ligands derived from HLA class I leader sequences when US6 is expressed. In this respect, it is tempting to speculate that the signal sequence of UL40 is released into the ER lumen rather than the cytosol as described for the few known TAP-independent MHC-class I ligands (21). We present evidence that HCMV found a way to escape NK lysis by producing a TAP-independent HLA-E ligand that would allow HLA-E expression on HCMV-infected cells when the delivery of viral peptides into the ER is shut down. The efficient infection of appropriate target cells by UL40-deficient HCMV viruses is required to assess the biological significance of our findings. To permit expression of HLA-E molecules seems to be a selective advantage because a virus evolutionarily as distant as HIV pursues the same strategy (22). Recently similar results have been published by Tomasec et al. (23). We thank Dr. W. Weissenhorn and Dr. M. Lopez-Botet for providing material. ↵1 This work was supported by the Deutsche Forschungsgemeinschaft SFB 217 and by the Comité de Paris de la Ligue Nationale Contre le Cancer (Institut National de la Santé et de la Recherche Médicale Unité 462, Laboratoire Associé 10). ↵3 Abbreviations used in this paper: HCMV, human CMV; ER, endoplasmic reticulum; KIR, killer inhibitory receptor; β2m, β2-microglobulin; p.i., postinfection.